The competition begins at a specific date & time. (as is informed to the students chosen, via email / text message) The student should connect to the internet at his home / school / cyber cafe at least 15 min before this time. The student gets 3 hrs to write the essay and 15 min more to submit the same by email. Student must ensure that there is no power outage in this period or if there is then he/she can resume their work within a few minutes of the outage. Given the power fluctuations or random reasons why the PC may crash, student must keep saving the essay every few minutes. The essay topics will be emailed to the students selected from Stage 1. The essay should be submitted by email to director@abhinav.ac.in. If a student is unable to write the essay on the PC, he/she may write on paper in a neat handwriting, then either photograph or scan the pages with good resolution and send the images via email. The student may use the internet or dictionaries during the exam to read about or understand certain issues / terms. However, directly copying content from the net or inserting quotes of other philosophers verbatim (which the student is not likely to know before hand) would be grounds for disqualification. Writing an essay is the key test of a philosophical thinker, since most deep thoughts cannot be conveyed easily by verbalization and the arguments needed to convince the "audience" are usually intricate. Here are some guidelines about how to write an essay especially for the Olympiads. Philosophy progresses via debates. These debates not spoken, but penned down by philosophers to argue and counter-argue about the work of other philosophers. Thus the primary aim of writing the essay is to discuss the thoughts of the philosopher presented in the topic, with the view to either approve or disapprove of them. Hence the student must first try to explain the philosophers point of view and then put in their own perspectives. The student is free to disagree with the topic, however, agreement or disagreement should be rational and clear reasoning and examples should be presented for either point of view. The stage 1 tasks are online at http://philo.abhinav.ac.in/InPOStage1_Tasks.htm. You can give them anytime on Sunday, 21st Dec. 2014 until midnight. For either link you would need a Gmail login. 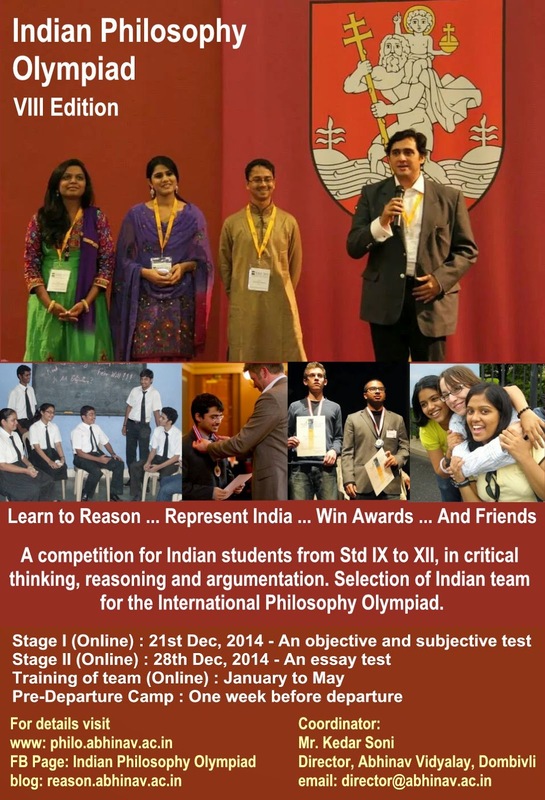 I am pleased to announce the start of the Indian Philosophy Olympiad - 2015. This is an online competition for Indian high school students of any stream (Std IX to XII). This is also a selection and training process for the forthcoming International Philosophy Olympiad to be held in May 2015 in Estonia. Please see the poster. The InPO selection rounds will proceed in two stages - 21st Dec and 28th Dec 2014 - both Sundays. The rounds will be online with the first stage having objective and subjective questions will be an open paper to be solved throughout the day (should not take more than 1.5 hours, ideally). The second stage is an essay test for those selected from the first stage. This will be time bound to be finished within a stipulated time. For more details on the selection process please visit our website. To enroll please fill up the form here. There are no entry fees. The task sheet for Stage 1 will be activated at the scheduled time. The tasks for Stage 2 will be emailed separately to the finalists. To prepare for stage 1 here is the previous years question paper. For stage 2 prep, you could see the essays of the past years winners of the Int'l Olympiad at http://www.philosophy-olympiad.org/ by scrolling down to see the medalists names and the "text" link besides them. Also, you could see the Baltic Sea Essay Event winning essays at http://feto.fi/in_english.htm. For any other information, please mail me at soni.kedar@gmail.com. 3. Most educated Indians wish that Modi becomes the prime minister. Thus Modi is the ideal choice. Premise 1 - Most educated Indians wish that Modi becomes the prime minister. Conclusion 1 - Modi is the ideal choice for the post of prime minister. Premise 3 - The choice of educated Indians is the ideal choice. 3B. Saying "most educated Indians" is an example of a "hasty generalization" type of fallacy. (Though not as extreme as saying "all educated Indians") Instead of saying that, the writer could have said - according to ABC Survey, XYZ % of educated Indians wish that Modi becomes the prime minister. This would increase the credibility of the argument by citation of a source and avoid hasty generalization. 3C. If Premise 3 is assumed, the argument would be valid. But in order for the argument to be a sound one, there would have to be clarification about the truth value of Premise 3. Premise 3 does not answer the question - "Why is the choice of educated Indians an ideal choice?" Indeed, such a claim is controversial and debatable in itself, as it is establishing the superiority of the choices of educated Indians over those of uneducated Indians. Thus, this premise is an example of "begging the question" type of fallacy. Also, saying that Modi is an ideal choice for the post of prime minister just because most educated Indians think that he is the ideal choice for the post of prime minister is an example of the "ad populum" type of fallacy. D1: Humans can't be trusted to self-govern! A1: If you can't trust the people with freedom, how can you trust the people in power? D2: Because they were elected! A2: But they are also one of the people (who can't be trusted), are elected by the people (who can't be trusted) and represent the people (who can't be trusted). Why should I trust the system? Is the system run by people made of a finer clay than the rest of humankind? A3: show me the contract and my signatures on it! D4: "We the people of India....."
A4: Hey! Those aren't my signatures! D5: Are you not part of the people of India? Do you wish to be exiled from the nation? A5: I'm part of the people of India, and no, I do not wish to be exiled, but those aren't my signatures. I could create a similar contract and write "We the people of Earth..." on it. Does that mean everyone on Earth, including the future generations to be born on Earth have consented to it? D7: Then you cannot complain. A7: show me the contract and my signatures on it! D8: "We the people of India....."
A8: Hey! Those aren't my signatures! D9: Are you not part of the people of India? Do you wish to be exiled from the nation? A9: I'm part of the people of India, and no, I do not wish to be exiled, but those aren't my signatures. I could create a similar contract and write "We the people of Earth..." on it. Does that mean everyone on Earth, including the future generations to be born on Earth have consented to it? D11: Then you cannot complain. 4A - I. D1 is a hasty generalization. It would have been better to say that some humans cannot be trusted to self govern in some aspects. That would be a more modest statement. Also, D1 is does not answer questions like "Why can't humans be trusted to self govern?" Thus, D1 begs the question. 4A - II. A1 - If one cannot trust people with freedom, then one cannot trust people in power. Basically, the anarchist (A) is saying that if P1, then C1. Therefore, if not C1, then not P1. A is applying reductio ad absurdum. According to A, the democratic (D) is saying C1, along with not P1. This is not logical according to A. D does not answer the question "Why can't humans trust people with freedom if humans can't be trusted to self-govern". Thus D begs the question here. 4A - III. "Can't trust people with freedom" has two possible meanings. One meaning is - "people can't be entrusted with freedom or people can't be trusted to use freedom properly". The second meaning is - "people having/ possessing freedom, i.e. - people who are free cannot be trusted". The second meaning seems unlikely as it would lead to the conclusion - "people who are not free can be trusted" which does not seem to be relevant to the discussion. Thus, the first meaning can be taken to be true. However, as no clarification about the second meaning has been given, we can't completely discard it and thus this seems to be a form of equivocation. Also, I do not wan to present a false dichotomy here. It is possible that there may be more possible meanings than those that I have discussed. It's just that I haven't thought of them. 4A - III. The issue raised by D is "not trusting people with self-governance". The response given to it by A lead us to the issue "whether or not to trust people in power". A has raised a side issue. Thus is could be an example of the "red herring" type of fallacy. Then again, I am assuming that the issue raised by A is a side issue and I am not answering the question "Why do you consider the issue raised by A as a side issue?" Thus, I could be considered to be begging the question. 4A - IV. A1 Part 2 is about whether to trust people in power. The areas in which the people in power are to be trusted or not, are not specified. It would be better to question whether to trust people in power regarding xyz issue, thus avoiding a hasty generalization. Also, instead of generalizing about all people in power, it would be better to talk about trusting abc people who are in power regarding xyz issue. "Trust" can have two meanings. One is comparatively straight forward - regarding specific issues like "I trust abc to develop better transportation". The second is broader, as in "I trust abc will be change our country". Thus, this could be considered as an example of equivocation. 4B - I. Restatement - People in power can be trusted because they are elected. Premise 1 - People who are elected can be trusted. Conclusion 1 - People are in power can be trusted. Premise 2 - People who are in power are elected. 4B - II. Premise 2 seems to be reasonable on a broad scale, as we are talking about democracy which consists of electing the people who are in power. But if we delve into specifics, we can question whether we are talking about direct elections, indirect elections, and other such details. 4B - III. Premise 1 does not answer the question - "Why can people who are elected be trusted?" and thus begs the question. As discussed above, it also makes a hasty generalization. It would have been better to say that "Some people who are elected can be trusted in some issues". 4B - IV. It is possible to accept Premise 1 if the question - "Why can people who are elected be trusted?" is answered satisfactorily. However, once Premise 1 is established, another question arises. Is "being elected" a necessary condition in order to trust someone. Or is it a necessary and sufficient condition? These questions would probably need to be addressed too. A2 Part 1 - But they are also one of the people (who can't be trusted), are elected by the people (who can't be trusted) and represent the people (who can't be trusted). A2 Part 2 - Why should I trust the system? A2 Part 3 - Is the system run by people made of a finer clay than the rest of humankind? 4C - I. The doubt raised in A2 Part 1 could be made clearer by specifying the kind of "trust" involved, thus avoiding hasty generalization. Restatement of A2 Part 1 - But they are also one of the people (who can't be trusted to self-govern), are elected by the people (who can't be trusted with freedom) and represent the people (who can't be trusted with power). Without clarifying what kind of trust is involved, equivocation occurs. Different kinds of trust are applied in different places, but are presented to mean the same, The aspects of the different forms of trust that are not relevant to this point are compared, and thus this could be considered as a weak analogy. Premise 1 - The system of electing people involves the untrustworthy people mentioned in A2 Part 1. Conclusion 1 - The system of electing people cannot be trusted. Again, questions like - "In which aspects can't the system be trusted?" arise. If this question is answered, we could say that the system of electing people cannot be trusted in xyz aspect. Following that, questions like - "Are the properties of the system of electing people a sum of the properties (regarding not trusting) of its components (people)?" "Which properties (regarding not trusting) that are displayed in the components (people) will be displayed in the system?" "Are the people the only relevant components of the system of electing people? (To put it more generally - Have we identified all the relevant components of the system that would contribute to its properties?)" would arise. These questions would need to be addressed. 4C - III. A2 Part 2 and A2 Part 3. The thought put forth can be expressed as - If the people who run the system are made of a finer clay than the rest of humankind, then the system can be trusted. Premise 1 - The people who run the system are made of a finer clay than the rest of humankind. Conclusion 1 - The system can be trusted. Premise 2 - The people who are made of a finer clay than the rest of humankind can be trusted. Premise 3 - The properties (regarding trust) of the people who run the system contribute to the properties of the system. Basically , A is questioning whether Premise 1 is true or not. However, A has not questions regarding Premise 2 and Premise 3 and is thus begging the question. 4C - IV. The main issue put forth by D was regarding the object - "people". A has introduced a new object - "system". The system, thought related to the people, is more complex and would require a broader perspective. Thus A is digressing from the main issue "people" by introducing a new issue "system". Thus, this can be an example of the "red herring" type of fallacy. Premise 1 - The system is based on a "social contract"
Premise 2 - The system is based on the "will of the people"
D does not answer questions like "How is the system based on a social contract?" and "How is the system based on the will of the people?". D thus begs the question and does not establish persuasive premises. D also does not establish clarity about terms like - "social contract" and "will of the people". Premise 1 - A system based on a social contract and will of the people can be trusted. Premise 2 - The system in discussion is based on social contract and will of the people. D does not answer questions like - "Why can a system based on social contract and will of the people be trusted? ", thus begging the question and not providing a persuasive premise. Also, if we assume that D is able to answer this question satisfactorily, other questions arise. They include - "Is it a necessary condition for a system to be based on social contract and on will of the people in order to be trusted?" and "Is it a necessary and sufficient condition for a system to be based on social contract and on will of the people in order to be trusted"
4D - III. The question raised in A2 Part 3 is not answered. 4E - I. A assumes that the contract is something like a physical object that can be shown. It is possible that the contract could be an abstract. Here, the burden of proof rests on D as it is now D's responsibility to show the aforementioned contract to A. Premise 1 - The signature of an individual on the "social contract" represents the "will of the people" or the "will of the individual"
A does not answer the question "How does the signature of and individual on the social contract represent the will of the individual, and by extension, the will of the people?". Thus, A begs the question. A is claiming that the existence of his/her signature on the contract will dictate whether it represent the will of A. D quotes the Preamble of the Constitution. D assumes that the Constitution is the aforementioned social contract. Why D does not answer the question - "Why is the Constitution the social contract?" thus begging the question. A commits an "ad populum" fallacy. Just because A's signature is not on the the Constitution, does not mean the Constitution does not represent the will of the people. A could make the statement clearer by saying the the Constitution does not represent the will of A. Unspoken premise - The will of each individual is necessary before generalizing and commenting about the will of the people. The premise would have to clarified as it raises questions like - "How many individuals' will should be taken into account when talking about the will of the people?". A does not address such questions and thus begs the question. D does not persuasively establish the above two statements. D thus begs the question. A's analogy of a contract for the people of Earth to the Constitution of India is a weak analogy. The similarity A is considering is the absence of the signatures of all the involved individuals. A does not take into account other factors which give credibility to the Constitution of India like the background and context in which it was created, its relevance in the lives of Indians and so. Such relevant factors have not been considered in A's "Earth contract"
D6 is an example of the "ad hominem" fallacy where D attacks A personally in order to weaken A's argument. D's does not answer the question - "Why can a non-voting person not complain?" and thus begs the question.